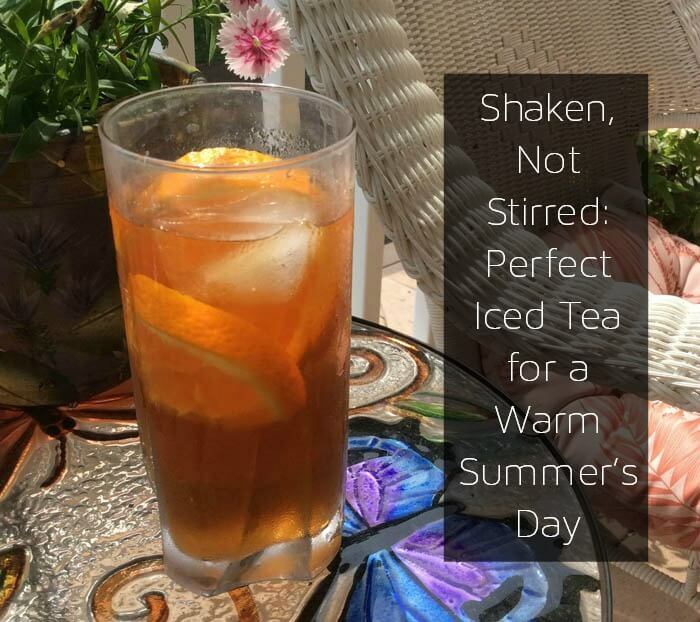 Few things feel so good during warm weather as a nice, cold glass of iced tea. Just sipping it brings back memories of my mom’s sun tea, which was brewed by the gallon all summer long. Whether you’re an iced tea veteran or a beginner just exploring the world beyond the tea pot, this is our deluxe guide on how to make iced tea with loose leaf tea. The first, and most important, step to making iced tea is deciding which tea you’re going to use. Just about any camellia sinensis-based tea will do well iced, though stronger teas like blacks, oolongs, and certain greens give out the best flavor. Be careful with herbals; many of them just don’t taste right when iced. Some flavor suggestions from the Plum Deluxe tea collection: mint, rose black tea, hibiscus, or apricot. Or, just explore explore all of our loose leaf iced tea recommendations. Once you have your tea of choice, it’s time to brew! If you’re in a rush, you can brew a hot cuppa and pour it over ice, but that could water it down. If this is your main method, Dandrea counsels you to brew your tea stronger, not longer, to hold on to the flavor and stave off bitterness. That means adding more tea to your brew, not more brewing time to your tea. If you have a little foresight, it’s actually super easy to cold brew a delicious, refreshing glass of iced tea. All you need to do is place 2 teaspoons loose leaf tea into a glass (or more, scaling up if you’re making a pitcher’s worth), add cold water, cover, and let it sit in your fridge overnight (or 4-6 hours if you’re impatient). In the morning, you’ll have a nice, cold glass of tea that you can strain out over ice and enjoy. Don’t worry about the tea getting bitter from steeping too long — a special side-effect of cold brewing is that it doesn’t draw the bitterness out of the leaves the way hot water does. We’ve all heard about this “shaken iced tea” thing at Starbucks, right? But what exactly is this magic they’re making – some sort of secret code from the “unofficial how to make iced tea with loose leaf tea the best way” guide? I always thought it was as simple as brewing a mug of tea and pouring it over ice and shaking it, but that just made for a really watery, lukewarm beverage. The key, according to Dandrea, is to start out with cold tea and to make it colder. Here’s how you do it: Combine a handful of ice and your cold-brewed tea in a cocktail shaker, then cover and shake well (when it’s too cold to hold, you’re done). Strain out into a glass with more ice and sip away! You’ve got the basics down now, right? So let’s pump things up! There’s so much more you can do to make your already delicious iced tea downright decadent. The thing about cold brewing tea is that it’s really hard to sweeten; I always end up with lots of crunchy sugar bits at the bottom of my glass. An easy solution is to mix up a bottle of flavored simple syrup and use it to add sweetness and complexity to your tea. To make syrup, simply bring 1 cup water and 1 cup sugar to a boil, whisking until sugar is dissolved. Then remove from heat and stir in 2 tablespoons of whatever you’re using for flavor (Dandrea recommends lavender, citrus zest, mint, or a split vanilla bean). Allow the syrup to cool before straining out the flavor ingredients and into a bottle. It should keep in the fridge for a week. Frozen or fresh fruit can also add a subtle sweetness as well as flavor. Summer berries such as raspberries and strawberries are perfect, as are orange slices. If you go with frozen fruit, you can even use it in place of ice cubes! If you really want to spice things up, try infusing alcohol with tea. Yes, you heard correctly: infuse tea in alcohol. Spirits like vodka and gin can take the tea flavors well, and you can also add tea to your wine. Dandrea recommends going with whatever you would normally drink and adding 0.5-0.7 ounces of tea to the bottle. Let it steep overnight, then strain out the tea and pour the alcohol back into its bottle to use in cocktails, sangria, or just on the rocks. Having fun steeping tea in your favorite vodka? This little cocktail puts said spirit to good use. We recommend using a black tea, perhaps with a hint of vanilla. This is one martini you’ll want without the olive. Fill a shaker with the ice. Combine all ingredients, cover, and shake well. Strain into martini glass. A twist on the golf legend’s classic! 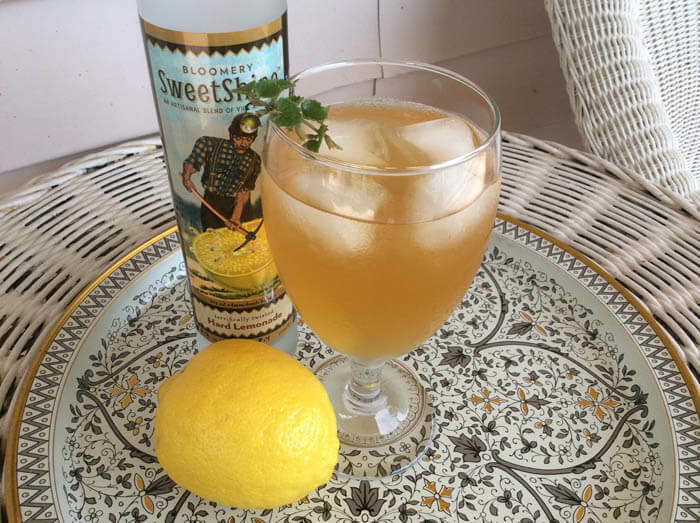 You can use any lemonade with this, hard or not, but we really enjoyed it with Bloomery SweetShine Hard Lemonade and our Sunshine in a Cup Tea. Fill a shaker with tea, hard lemonade, and ice. Cover, shake well, and strain into an iced tea glass over more ice. Garnish with a sprig of mint to make yourself look classy. 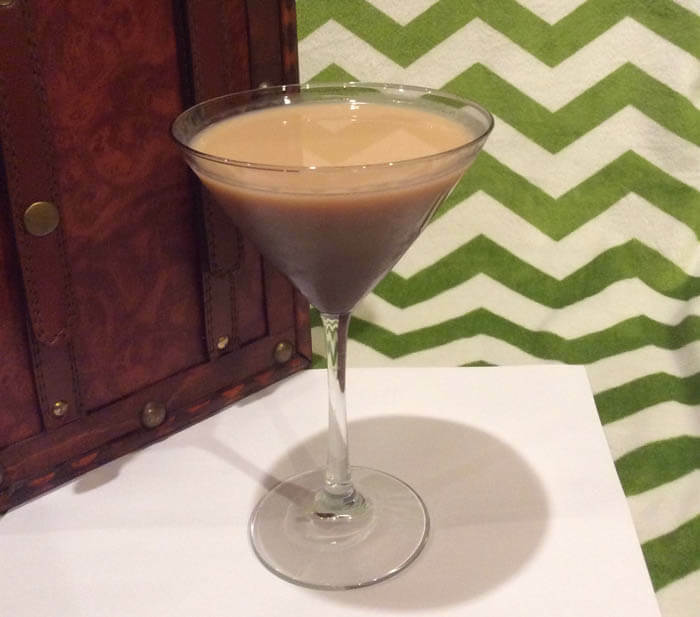 Of all the tea combinations and cocktails we tried for this article, this drink — inspired by Kari Dandrea of Pureblend Tea — is my absolute favorite. Knock it up a notch with our Pacific Northwest Evergreen Mint Tea. Muddle mint leaves with lime syrup in a metal shaker. Add ice, tequila, and tea, then cover and shake well. 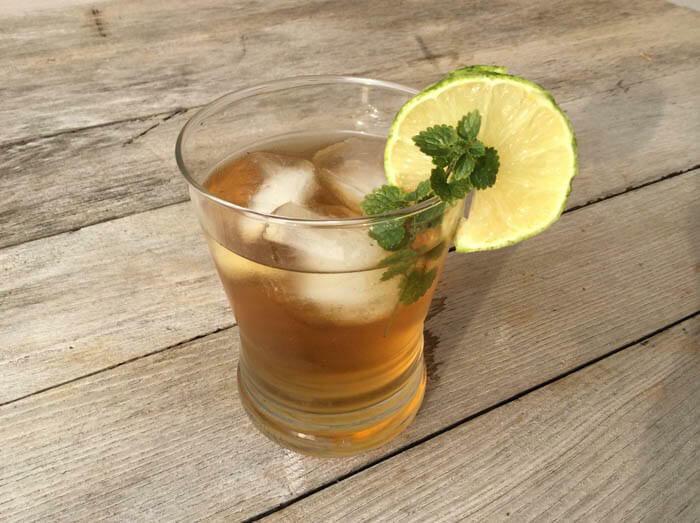 Strain into glass and garnish with a mint sprig and lime wedge. In a saucepan, combine 1/2 cup water and 1/2 cup sugar over high heat. Bring to a boil, whisking well until sugar dissolves. Turn off heat and add zest from one lime. Set aside and allow to cool before using. Syrup will keep in the fridge for up to a week (so make some more mojitos). 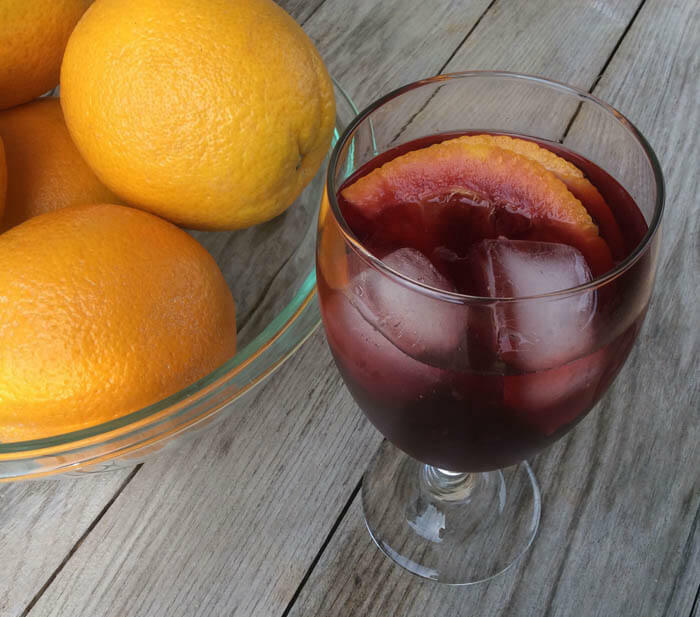 If you haven’t noticed yet, we’re kind of obsessed with sangria here at Plum Deluxe. While you can use any table wine, we recommend an unoaked red for this one. In a pitcher, muddle orange slices with a wooden spoon. Toss in blood orange tea into a bag and pour in wine and simple syrup (tuck tea bag under the orange slices to keep it from floating to the top). Cover and refrigerate 4-6 hours or overnight. Remove tea bag and stir in orange juice and brandy. Fill pitcher with ice. Sip with relish. Photos and video are courtesy of the author. 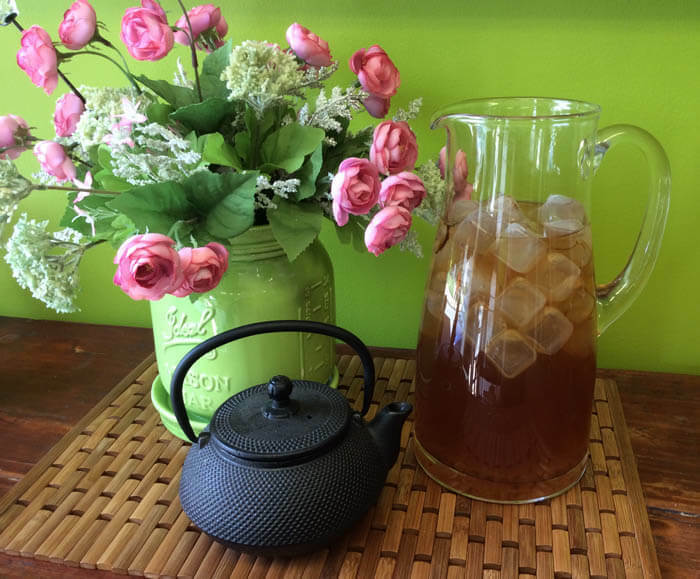 Still have questions on how to make iced tea with loose leaf tea? Join our tea of the month club, where you can swap tea stories with our community of tea lovers!